Manicured lawns, tree lined streets, biking and jogging lanes, winding roads and gorgeous lakes are just few of the amenities that makes The Shores perfect for families. 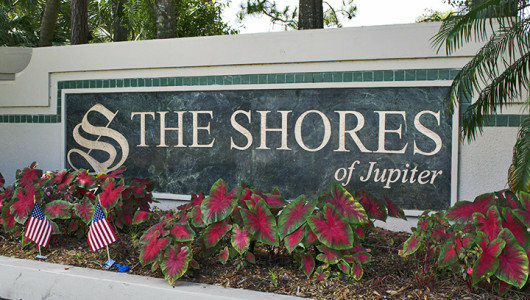 The Shores of Jupiter is composed of over 600 single family homes, built between 1986 and 2002. Homes range greatly in size, from 3 to 5 bedrooms and 1,600 to 3,300 square feet of living space. Enjoy low HOA which covers management fees, cable and maintenance of common areas. The Shores is conveniently located off Central Blvd, close to the Florida Turnpike and I95. There is easy access to shopping, dining, beaches and A rated schools. Beautiful and serene lakefront location on a quiet cul-de-sac. Mature landscaping with a dozen palm trees. Volume ceilings with arched interior doorways and transom windows. French doors open to pool and 4th bedroom/office. Lake views from almost every room. New carpet in master. This home is original and needs updating. Being sold ''As Is''.